One of the joys of being based out of the bay area is getting to actually visit the headquarters of some of these vendors. I've had one on one time with Antec, NVIDIA, Logitech, and my last visit to Corsair's headquarters in Fremont got me a good look at the early prototyping stages of both the Obsidian 900D and the Carbide Air 540. Corsair's designers were pretty enthusiastic about where they were going with what became the Air 540, and with good reason. Now that I've had a chance to handle the final product, I feel like I'm looking at the next BitFenix Prodigy. Outside of Lian Li's eclectic lineup, cube style ATX cases are rare as hen's teeth and seeing one from Corsair is especially unusual. 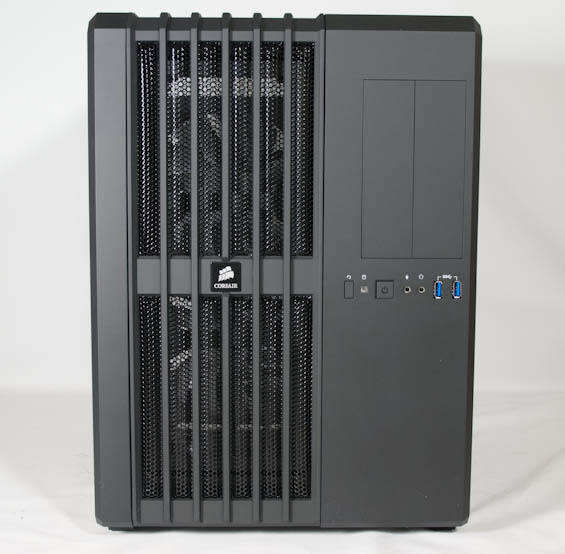 The one-off Graphite 600T notwithstanding, Corsair has tended to produce fairly conservative, extremely refined case designs. But the dual-chambered Carbide Air 540 is a radical departure and a much needed one. It's not a perfect design and there's plenty of room for improvement, but there are very good reasons I chose the Air 540 for my upcoming custom liquid cooling loop review. Internal 2x 3.5", 4x 2.5"
Dimensions 16.33" x 13.07" x 18.03"
I'm going to address a minor elephant in the room before getting into the nitty gritty of the Carbide Air 540: a cube-shaped enclosure is arguably less space efficient than a typical tower. As someone who lives in an apartment smaller than he needs, I can tell you that floor space is always at a premium, and the Air 540 does have a pretty large footprint. It's not as tall as a conventional case, it's a bit wider, and when running it probably looks like a good place for a cat to sleep. Of course, on the flipside, by breaking out of the ATX standard, Corsair's designers were suddenly free to start rethinking about how everything can come together to truly maximize performance and efficiency. The Carbide Air 540 is in many ways operating on the same principles SilverStone's Temjin TJ08-E, Raven RV-04, and Fortress FT-04 are: as direct a path for air as humanly possible. 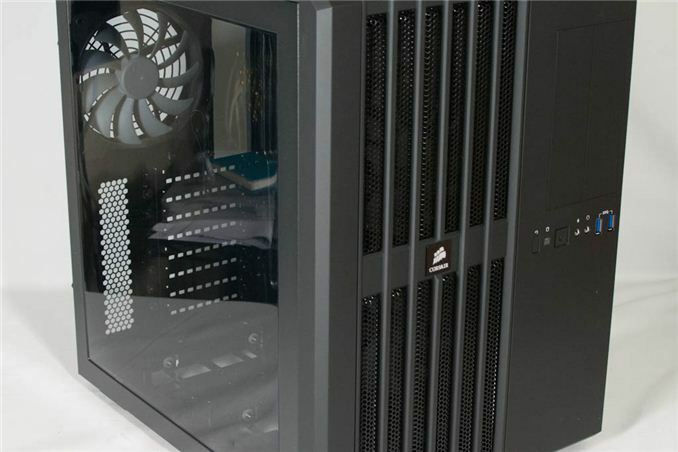 Yet while SilverStone's designs moved the power supply and 5.25" bays to the top of the enclosure, Corsair made the enclosure wider and created a separate chamber for all the parts that didn't need direct, active cooling. yeah, the empty space begs for drive bays, but they would be hard to wire and place. maybe two 3.5 hot-swap bays below the DVD bays would get the job done - even if a little expensive.